AlphaScreen uses beads to study biomolecular interactions microplate reactions. Alpha technology is a bead-based method of detection that is becoming more common in drug discovery. The biggest appeal is that Alpha assays are homogenous and do not require any wash steps which can make a perfect function assay. Alpha technology uses two different beads, a Donor and an Acceptor. 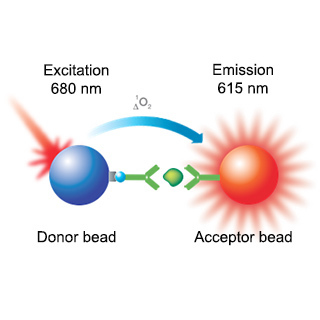 Once both beads are with a close proximity (about 200 nm) they produce a luminescent/fluorescent signal. The Donor bead contains phthalocyanine which converts ambient oxygen (O2) to singlet oxygen when excited by a plate reader. This singlet oxygen has a very short half-life (4 µsec) which is just enough time to diffuse 200 nm. If a singlet oxygen is able to interact with an Acceptor bead before it falls back to ground state, energy is transferred from the singlet oxygen to thioxene derivatives which are in the Acceptor bead. This ultimately cause light to be released which is read, which creates a quantitative signal and is proportionally related to the amount of analyte in a sample. AlphaScreen assays can be designed to work two different ways, either single analyte or a complex of two macromolecules. The picture below depicts both Acceptor and Donor complex to either side of a single analyte. In this case the Donor is bound to an antibody which binds to a constant region of an analyte while the acceptor bead is bound to an antibody which binds to a modification of interest. When the modification is not present the Acceptor bead does get close enough to the Donor bead to create a signal. In an assay with two macromolecules, the Donor will bind to one of the molecules of interest and the Acceptor will bind to the other molecule of interest. This means that if the macromolecules do not bind to each other, there is no signal. 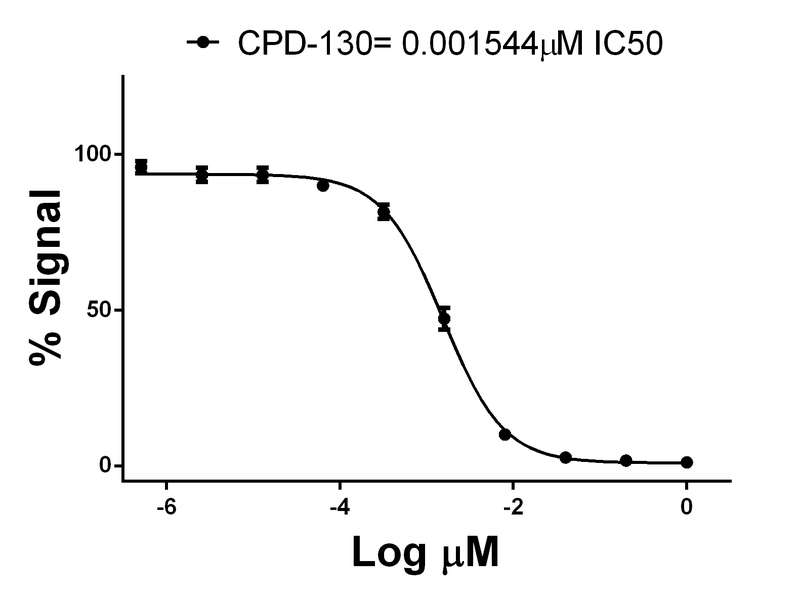 An AlphaScreen assay was used to generate an IC50 for small molecule CPD-130 through detection of the product of an enzymatic reaction. AlphaScreen technology is sensitive down to picomolar levels of analyte, allowing for consistent determinations of IC50. In a 384-well format, low volume reactions allow for HTS of small molecule libraries and reductions in reagent cost.